"Strepsils is one of the most popular drugs to relieve unpleasant symptoms of the common cold: in particular, it is well helps with pain in the throat. However, to give his children should be wary. 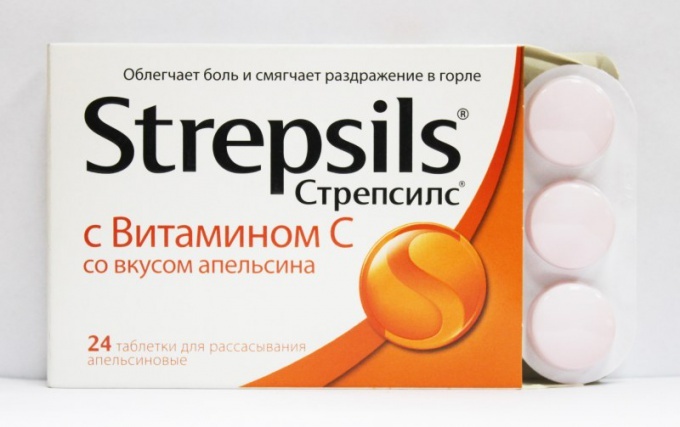 The popularity of the drug "Strepsils" is that it is quite effective for sore throat and is sold without a prescription. The effect of the drug "Strepsils"
The drug is available in a wide range of dosage forms, including lozenges and tablets for sucking with a variety of flavors: orange, lemon, strawberry, cherry menthol and many others. Therefore, anyone who feels uncomfortable symptoms of approaching or has already come of the disease, may choose the suitable variant of the medicine. The effect of the drug "Strepsils" is based on the antiseptic effect that it has on the mucous membranes, inflamed in catarrhal diseases of various etiologies. In particular, in the complex therapy the drug can be used in the treatment of tonsillitis, pharyngitis, and other inflammatory and infectious diseases of the mouth, nose and throat. Due to the content of antiseptic components that are "Strepsils" is having on mucous membrane soothing effect while removing the inflammation and pain symptoms, thus acting in the role of a local anesthetic drug. In addition, this medicine is able to alleviate nasal congestion and ease other symptoms of inflammation of the throat, nose and oral cavity. However, when the use of "Strepsils" should be borne in mind that in its structure contains enough potent substances, for example, dichlorobenzyl alcohol. Therefore, its use in the treatment of colds in children should be used with caution, and the use of children up to 5 years, and it should be deleted. More intense forms of the drug, for example, Strepsils plus, you can give only to children older than 12 years. The dose that can be given to children should be significantly reduced, compared to an adult. So, if the standard form of the drug "Strepsils" involves the use adults 1 lozenge or tablet every 2 hours during the intensive course of the disease, for children the time interval between meals preparation shall be not less than 4 hours. In excess of the permissible dose in children and in adults can cause unpleasant symptoms. For example, in the instructions for use of the drug mentioned allergic reactions and nausea, vomiting or diarrhoea. In order to prevent their occurrence should strictly follow the instructions for use of the drug and to prevent its overdose. However, even if you accidentally missed taking the regular tablets or lozenge, increase the dose no need, just take your next dose at the right time.